Mission style furniture is loved the world over for its impeccably strong, straight lines and seamless joinery. 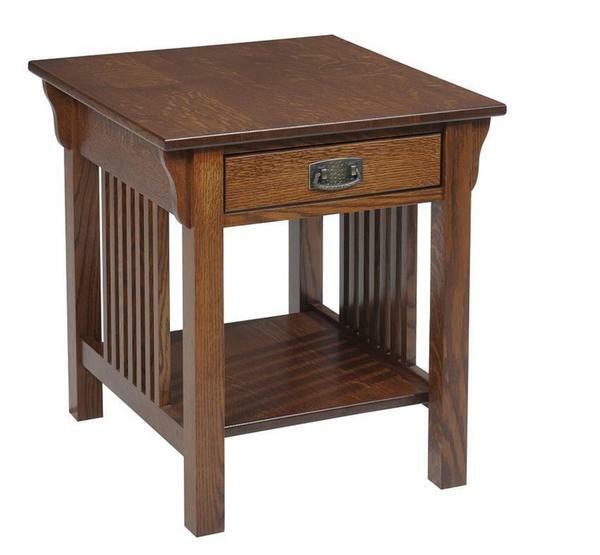 This Lexington Mission End Table - built, sanded, and finished to order in a small Amish woodshop in the northern United States - brings the best of Mission design to the living room in one perfectly proportioned, perfectly convenient solid wood package. Whether holding up favorite photographs, lighting, or books or decor, the Lexington's solid wood construction and timeless beauty mean that it will retain its refined elegance through long decades of living room life. Use the menus above to choose the ideal wood and stain for your custom Lexington. If you have any questions at all about this piece, or if you would like to talk with us about having our woodworkers craft a custom version of this table in a different size or shape, please don't hesitate to reach out to us by phone or by email. We love the classical grace captured in every inch of this table, and we would love to talk with you about the timeless beauty it brings to the home.